Key tags and keychains are perfect giveaways that will advertise your company and special cause. They make wonderful fundraisers for schools and sports teams as well as great gifts for your employees. Custom plastic key tags are printed in full colour on polyester card stock with compressed gloss laminate on both sides. Overall thickness is 28pt with a hole drilled in the corner with the option of two sided printing. Key rings and connectors available at an extra charge. Minimum order is 100 units. 2″ x 1″ • 2″ x 1 1/4″ • 2 1/2″ x 1 1/2″ rectangles with rounded corners • 2″ x 1 1/4″ oval • 1 5/8″ round. Contact us for a quote on custom shapes. Show off your logo, monogram, pictures and special messages with our clear acrylic key tags. These promo products are 3/16″ thick with a key ring and custom printed in full colour on one or two sides. Minimum order is 25 units. 1 5/8″ round • 1 9/16″ square • 1 5/16″ x 2″ rectangle • 2 1/16″ x 3″ rectangle. Custom keychains are printed in full colour with a gloss laminated surface that will enhance your photos and custom artwork. These items are 1/8″ thick with a key ring. Minimum order is 25 units. 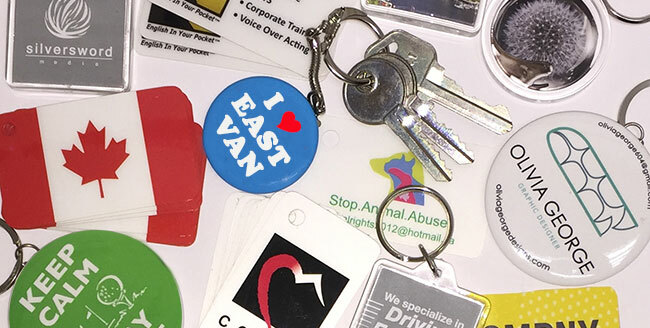 We custom make your key tags and keychains on site at our Vancouver, BC location. Keychains and key tags are digital printed in full colour (CMYK). RGB and Pantone® colours will be converted to CMYK. Plastic key tags are banded and stacked in boxes. Keychains and acrylic key tags are loose in boxes with packing paper. Visit our bottle openers, napkins, fridge magnets, and coasters pages. Also, take a look at our Idea Guide, which provides popular promotional products for various industries and events.